Maybe you have to be old enough to have lusted for a TR6 to remember the disaster of Bristish Leland. Keith Crain draws the lessons: Who can forget British Leyland? I got a feeling we're in for the repeat. Photo thanks to the TR6 site. And then there’s North Korea. Dependent on the charity of the international community to alleviate the hunger and suffering of its people, North Korea’s leadership has chosen to focus the North’s limited energy and resources on a reckless and ultimately self-destructive quest for nuclear weapons and intercontinental ballistic missiles. These programs have isolated North Korea globally and, quite literally, starved its people. The policy of the United States has not changed: Our goal is complete and verifiable denuclearization of the Korean peninsula, and we will not accept North Korea as a nuclear weapons state. North Korea’s nuclear program and actions constitute a threat to regional peace and security. We unequivocally reaffirm our commitment to the defense of our allies in the region. The transfer of nuclear weapons or material by North Korea to states or non-state entities would be considered a grave threat to the United States and our allies. And we would hold North Korea fully accountable for the consequences of such action. President Obama has offered an open hand to tyrannies that unclench their fists. He is hopeful, but he is not naïve. Likewise, the United States and our allies are open to dialogue, but we will not bend to pressure or provocation. And on this count, North Korea’s latest reply to our overtures isn’t exactly something we would characterize as helpful or constructive. We will not stand idly by as North Korea builds the capability to wreak destruction on any target in the region – or on us. At the end of the day, the choice to continue as a destitute, international pariah, or chart a new course, is North Korea’s alone to make. The world is waiting. There are no easy solutions to the challenges I have outlined this morning. And that brings me to my final point: the type of leadership you can expect from President Obama and the United States in coming years. When Secretary Clinton visited the region, she said that this administration is committed to listening to the views of friends and partners across the globe. For example, we are now beginning to negotiate accession to the Treaty of Amity and Cooperation – which demonstrates our willingness to take regional norms into account as we consider our relationships across the globe. The President, similarly, has spoken of a more collaborative and consultative foreign policy – one committed to forging common solutions to common problems. Do not get me wrong: The United States will continue to be assertive on the international stage. We will protect our allies and our interests. We are, as a former secretary of state said, an indispensable power – but we are also one that is aware of our own limitations, aware that the world and nearly all the challenges we face are simply too complex to go it alone. Let me close with a final thought. Throughout more than two centuries, the United States has been a beacon of freedom. In our efforts to protect our own freedom – and that of others – we have from time to time made mistakes, including at times being arrogant in dealing with others. But we always correct our course, and our willingness to do so is one of our most enduring strengths. In the end we know that our own democracy’s strength ultimately depends on adhering to our nation’s values and ideals – and on the strength and independence of other democracies and partners around the world. Those remain the guiding principles of our foreign policy today. For all the talk about partners, it's going to be a lonely wait for the indespensible power to hear North Korea's decision to continue as a destitute, international pariah, or chart a new course.. Letting the madman Kim decide the future a frighting option. A site I found reading NPR's interview with Roxanna Saberi. Silva Harotonian, an Iranian citizen of Armenian descent, recently held a modest role with a humanitarian organization working to improve child and maternal health in Iran. Her work and life were interrupted on June 26, 2008 when she was detained by Iranian authorities and charged with participating in an effort to overthrow the Iranian government through a ''soft revolution.'' On January 19, 2009, she was sentenced to three years in jail. My cousin Silva is a kind, honorable young woman whose arrest was a tragic misunderstanding. Since she was arrested, Silva has sat in jail unable to tell her story, innocent of any intentional wrongdoing. Now I am speaking for her. Please look through this site to get to know Silva’s story and to sign the appeal to Iran’s government using your voice to help Silva regain her freedom. Not a familiar name to many anymore I guess although a fine biography of him has recently come out. I took Economic History from Bob Voertman at Grinnell long ago so I remember. From Carl Schramm writing Schumpeter's Moment in yesterday's WSJ. Is this the moment the Austrian economist Joseph Schumpeter had envisaged when he spoke of "creative destruction"? After all, it was Schumpeter who worried more than any other modern economist about what might be called the fragile condition of capitalism. He did so having lived through the economic horrors of Weimar, witnessed the terror of Soviet-style political economy, experienced the Depression -- and seen the chaos of World War II. Plenty of destruction, to be sure. His life's work concentrated on entrepreneurs renewing the economy through what he called "creative destruction." Joseph Schumpeter's answer to all this is that the most important citizen is not the politician, nor the big businessman, nor the bankers on Wall Street. They are important, but not central to the renewal of democratic capitalism. That role, that burden falls to our fellow citizens who, in the face of the challenges we see all around us, are ready to pursuit what entrepreneurs do: Create the new, create jobs and make the wealth that will be more necessary than ever to purchase a future worth living. Arlene's first novel is coming out soon. Here's a link with a taste of it. What? An activist winning the lottery? How can that be? True Activists don’t buy lottery tickets. They protest against it. My kinda book. I'm a guy appalled at Illinois considering video poker machines on every corner to balance the budget yet I get lotto fever when that jackpot goes over a $100 million. Good luck Arlene. Hoping to see you on Oprah, and then in Hollywood! I received a very nice email from a gentleman who grew up at the corner of Quincy and Cicero Ave in the 1940s. He lived at 4804 W. Quincy. He lost the few pictures he had in a fire and now he having memories of the place and longing to see it again. Can you post something on your blog asking anyone with photos to email me a copy. Does any of your followers remember the Rinder family? Let me know or write Arlene over at her blog. Also, if anyone has pictures of Chicago's West Side (and I've got a pretty broad definition of that: from Fullerton to 3th; from the River to maybe Omaha?) please send them along to me. I remember getting off the Congress at Western once and my Dad told me to take a good look because the city is always changing. Chicagoans always tearing down and starting over again. So pictures of the West Side old or today always welcome. Chicago Daily Observer's obituary on a brave guy from Illinois. Julie Hamos appeared on Fox News this morning and announced the release of a petition calling on Governor Quinn and legislative leaders to enact caps on political contributions. While some legislators are calling for reform light, the petition sets the cap at $2,400 per individual per election cycle. ...and I'm on it now. Four bloggers on the call and maybe a few lurkers. Hamos: We just past significant Capital Bill and things are moving fast, so what are we doing on ethics reform? She's offered a caps plan. She believes it's essential feature. She'll be sponsoring a bill on FOI reform. Pat Collins coming to Springfield tomorrow. They'll be a bill starting in the Senate, and she's not happy that this is the best that we can do (Not sure if her problem is that it's starting in the Senate instead). Want's to mirror the Federal law. Cap once in the primary and once in the General. Important feature is are the limits on the total about an individual can contribute? Also limits on Leader Transfers. Important features the Senate Bill will get tangled. She expects Pat Collins to come out against the Senate version. Her proposal is to stays with Federal Limits: 2,000 $400 caps. No laws are going to stop people electing crooks. Josh Calvin (?) How has lack of limits effected your own politics? He cited lack of progress on regulating pay-day lending outfits. Hamos: The Industry has hired 60 lobbyists. She's tried to work with the more reputable of them, but... they do wield power with campaign contributions. They have access to a lot of money. It's also about perception. When Blagojevich came to light it showed a politican "holding up" citizens. Some honorable people get big contributions but it still raises bad feelings with the public. 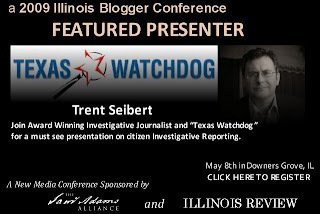 Illinois is the wild west of campaign finance. David Orsby: Have Federal limits Rep Hamos seeks to any good in Washington? Would she vote for the current bill as it stands? No, she wouldn't support it. It's a challange but she thinks it's an attempt to undermine what they're trying to do. I'll write up more in a bit and link her cites... Live blogging a call no easy task! [***] I couldn't get the differences in detail between the caps proposed by Rep Hamos, and the Caps proposed by Cullerton and Madigan in the bill that's appeared in the Illinois Senate. Rep Hamos said the rules would favor the Senate, and the caps so large they would be meaningless. The bills are the latest in a series of ethics measures that Madigan and Senate President John Cullerton, D-Chicago, are backing in the wake of Blagojevich's arrest and removal from office. The proposals came after hours of testimony by a special joint committee off the House and Senate, but that testimony looked at ethics issues in general -- not the specific proposals approved Thursday. Those measures popped up in an entirely different committee Wednesday, passed after little discussion and then were approved by the House a day later. Cindi Canary, head of the Illinois Campaign for Political Reform, said she hadn't seen the legislation and couldn't comment on whether it would have much impact on government corruption. She noted that even bills meant to improve government transparency are being handled in typical legislative fashion, surfacing at the last minute with little time for review. "If anything, this year is more mystifying than ever, and that says a lot," Canary said. Mystifying deals between Cullerton and Madigan not a good sign. I signed Hamos's petition just to stick it to these two. We are preparing to transfer another detainee [Ahmed Khalfan Ghailani ] to the Southern District of New York, where he will face trial on charges related to the 1998 bombings of our embassies in Kenya and Tanzania - bombings that killed over 200 people. Preventing this detainee from coming to our shores would prevent his trial and conviction. And after over a decade, it is time to finally see that justice is served, and that is what we intend to do. Sure sounds to be Obama's got this fellow convicted already. Recall Chief Justice Stone and Justice Jackson on Nuremberg. "When did it become a crime to be one of a 'bad lot'? What was the specific badness for which they should be openly and frankly punished? And how did he know what individuals were included in the bad lot? . . . . If it would have been right to punish the vanquished out-of-hand for being a bad lot, what made it wrong to have first a safeguarded hearing to make sure who was bad, and how bad, and of what his badness consisted?" Bush and Cheney sought the compromise between Stone and Jackson: to sort out the bad lot and hold them for the duration. Obama sounds to me like he's going to treat terrorists, at least Ahmed Khalfan Ghailani , as common criminals for what can only be Stone's high-grade lynching party. (Or maybe life in a super max with no return home come AQ's Fatwa of surrender). So who's betraying American Values here? Show trials as criminals for warriors at war with the United States? Obama's words betray him:...would prevent his trial and conviction. Hold them in Gitmo for the duration. To do otherwise is a lie. Afterthought: ... would prevent his trial and conviction.... Remember Obama a Constitutional Lawyer... I can't believe this just a slip of his pen in the speech. In LA at the end of July. HT Chicago News Bench. Defeated St Charles Mayor Klinkhamer serves as Foster's Gatekeeper for Stimulus Handouts. Former St. Charles mayor Sue Klinkhamer certainly landed on her feet. firefox1010 wrote on May 14, 2009 8:51 p.m.
"This article is a joke. Foster preaches transparency, but it seems his idea of transparency is to let everyone know via the newspaper that you have to kiss Klinhamer's...er...ring to get access and dollars? That doesn't seem to jive with President Obama's plans at all. Also, check out Foster's list of pet projects on his website - nothing for Jeff "Shill"kee - only the Dems in Aurora and Elgin. Thanks, Bill." Over at Prairie State Blue where Bridget and Razor Girl go at it Hammer and Tongs over the success with the Iraq Surge and nary a word about the 17k American Soldiers headed to Afghanistan. It doesn't seem a pressing topic there. No one is commenting on Carl's: Pres. Obama, what's the strategy on Pakistan? No wonder Democrats feel bamboozled and lied too. It's the decisions about tomorrow that count. Leave yesterday for the historians. Then I listen to my Congressman parody an Historic Speech consecrating our war dead. Does he know there is a war? That President Obama commanded another 17k troops to the battlefield. Is Foster so much a businessman and scientist he can not understand the sacrifice of warriors? A speech consecrating their lives used to commemorate stimulus projects back home? Foster, who is in his first term in Congress, noted that the project has helped him understand how Washington works. The budget for the experiment had been cut, but it was partly reversed by attaching an amendment to the Iraq War supplemental budget. “It’s a heck of a way to fund science,” he said. How our Congressman will square last years words with this year's reality will be an interesting dance to watch. 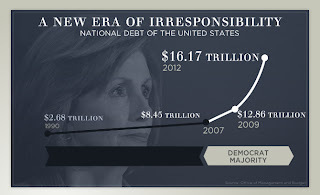 The financial irresponsibility of the federal government during the last 6 years of Republican rule has been breathtaking. 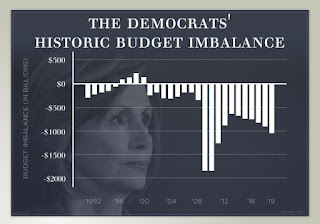 A projected 10-year 10-trillion dollar surplus inherited from the Clinton Administration has been reversed and turned into a $9 trillion dollar deficit. Party affiliation is no longer any guarantee of financial responsibility. Fixing this mess will depend on leaders with business skill and discipline. Chuck Schumer On "Torture" - "Do What You Have To Do"
To what you have to do a good deal broader than the measured opinions the administration contemplated. It wasn't do what you have to do which was Democrats then, and probably Democrats tomorrow should we sustain another mass attack. Individual lawmakers' recollections of the early briefings varied dramatically, but officials present during the meetings described the reaction as mostly quiet acquiescence, if not outright support. "Among those being briefed, there was a pretty full understanding of what the CIA was doing," said Goss, who chaired the House intelligence committee from 1997 to 2004 and then served as CIA director from 2004 to 2006. "And the reaction in the room was not just approval, but encouragement." Congressional officials say the groups' ability to challenge the practices was hampered by strict rules of secrecy that prohibited them from being able to take notes or consult legal experts or members of their own staffs. And while various officials have described the briefings as detailed and graphic, it is unclear precisely what members were told about waterboarding and how it is conducted. Several officials familiar with the briefings also recalled that the meetings were marked by an atmosphere of deep concern about the possibility of an imminent terrorist attack. "In fairness, the environment was different then because we were closer to Sept. 11 and people were still in a panic," said one U.S. official present during the early briefings. "But there was no objecting, no hand-wringing. The attitude was, 'We don't care what you do to those guys as long as you get the information you need to protect the American people.' "
I'm tired of Democrats as the party of the bamboozled. It's time for Speaker Pelosi and the CIA briefer to appear before the Truth Commission, under oath, and tell the world all. Illinois Review broke the story. John Boehner's site explains who these guys in Gitmo are. House Republicans today introduced the Keep Terrorists Out of America Act, legislation aimed at stopping the transfer or release of terrorists held at the Guantanamo Bay prison into the United States. The terrorists held at the Guantanamo Bay prison are neither nameless nor faceless, and they are not common criminals. They are some of the world’s most cold-blooded terrorists who have dedicated most of their lives to killing Americans and our allies. In short, they are some of the most dangerous men in the world. Finally Dem Rep. Adam Schiff on criminal trials for terrorists. He says trying them in American courts has a home court advantage. There is now way we can give these impartial trials. A trial would be a sham. They're not criminals. There warriors of the most dangerous sort, at war with the United States. If not killed on the battlefield, they belong in Gitmo for the duration: until bin Laden issues a fatwa of surrender. Then they can go home. Part one of a March interview on Al Jeezera. Alsammarae criticizes the Iraqi politics surrounding reconstruction. Clearly there are limits to doing things the Chicago way, because politics surrounds every decision back home. Have to wonder if all of this talk about corruption isn't a message for those back home in Illinois: Alsammarae telling us he knows plenty about corruption and who had their hands in what pots.